April is Jazz Appreciation Month. The destruction of the Royal Theater, and John Coltrane and Women of Jazz murals gives one reason to believe otherwise, but Philly celebrates jazz. Mayor Jim Kenney kicked off the celebration by presenting the Benny Golson Award to multi-instrumentalist and “Late Show with Stephen Colbert” bandleader Jon Batiste. I am honored to present the first Benny Golson Award to Jon Batiste, who exemplifies what can be accomplished in using your talents in educating our youth in the importance of the arts and culture. As I have said many times, arts education is not a luxury, it is a necessity and one of the most effective ways of helping our children grow and develop into not only more creative, but also open-minded and compassionate people. The Office of Arts, Culture and the Creative Economy organizes the month-long Philly Celebrates Jazz. Over 200 events are scheduled, including a photo exhibition, “Live Philly Jazz Vol. 2. The WRTI Jazz Listening Sessions will be hosted by Jeff Duperon. The hour-long conversations will be held before a live audience in the Art Gallery @ City Hall. The listening sessions are free but space is limited. Seating is first come, first serve and you must register. Over the course of Philadelphia’s jazz heyday, roughly 1940s to 1960s, there were jazz spots from the Aqua Lounge to Zanzibar Blue. A complete calendar listing of Philly Celebrates Jazz events is available here. Two years ago I launched All That Philly Jazz, a place-based public history project that is telling the story of Philadelphia’s golden age of jazz. In documenting the places where jazz history unfolded, I am also contextualizing the impact of jazz musicians and the jazz culture on the struggle for social justice. Fact is, the jazz culture was about “intersectionality” before the term was coined . As Philadelphia Inquirer architecture critic Inga Saffron notes in her column, “Ridge Avenue’s last standing jazz club,” gay performers such as the “Sepia Gloria Swanson” were an integral part of the scene. 1409 Lombard Street helps tell the story of artistic greats like Lady Day, Ray Charles, John Coltrane, Miles Davis, Nina Simone and McCoy Tyner. It also tells the story of disruption and defiance. In remarks to the 1964 Berlin Jazz Festival, Dr. Martin Luther King Jr. said jazz is “triumphant music.” If walls could talk, they would tell how the jazz culture broke down social barriers. The first racially integrated nightspot in Center City was a jazz club, the Downbeat. For the first time, blacks and whites mixed on an equal basis. Jazz musicians created a cultural identity that was “a steppingstone” to the Civil Rights Movement. At its core, historic preservation is about storytelling. The question then becomes: Who decides what gets saved and whose story gets told? The built environment reflects racial inequalities. Given African Americans’ socioeconomic status, few of the buildings associated with black history meet preservation standards regarding architectural significance. Although unadorned, they are places that tell a more complete American story. The stories of faith, resistance, and triumph are relevant to today’s social justice activists. Did you know the cover of a Nat King Cole album was shot in Elfreth’s Alley? Why Are Some Of The City’s Most Historic Black Churches Being Sold? Redevelopment In Sharswood: Will It Come At The Expense Of Preservation? Fast Forward Philly: What’s Next for Philly? 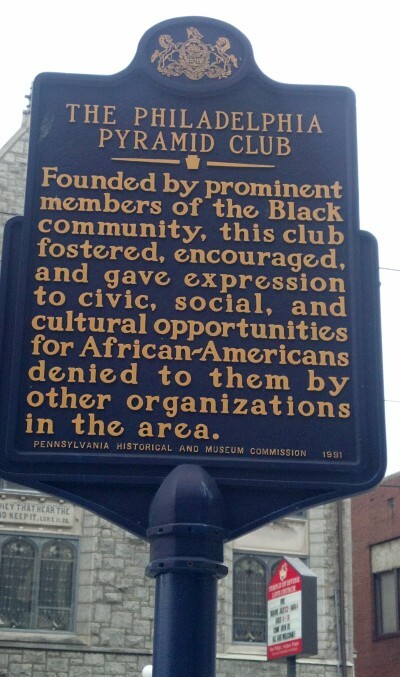 Founded in 1937 and formally opened three years later, the Philadelphia Pyramid Club was a small, exclusive club for black professionals. Its mission was to foster the “cultural, civic, and social advancement of Negroes in Philadelphia.” The membership fee was $120, and monthly dues were $2.40. The club hosted a wide range of social and cultural activities, including performances by Marian Anderson and Duke Ellington and, after 1941, annual art exhibitions for African American artists. It also hosted events with Dr. Martin Luther King Jr. and physicist J. Robert Oppenheimer, father of the atomic bomb. During the Pyramid Club’s heyday, its membership rolls were a Who’s Who of black Philadelphia. The club was dissolved in 1963. #BlackCultureMattersCultural HeritageCultural Heritage PreservationDuke EllingtonMarian AndersonMartin Luther King Jr. The Elmer Snowden Trio played here in April 1946. From 15th Street to Columbia Avenue (later renamed Cecil B. Moore Avenue), Ridge Avenue was a jazz corridor where legends-in-the-making roamed.